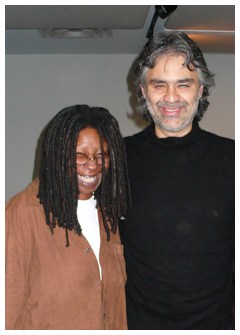 Whoopi's ongoing radio show in New York City has welcomed guests Lionel Richie and Andrea Bocelli. Now she's got The View, too. Another of America's open secrets became official Wednesday when Whoopi Goldberg appeared on the The View as a warmup for her new duties as the show's moderator. Known for bluntly speaking her mind, Goldberg is hardly a subdued replacement for foghorn Rosie O'Donnell. "The hot topics thrill me," she told grande dame Barbara Walters and holdover View panelists Joy Behar and Elisabeth Hasselbeck. Walters duly encouraged her to be at least a "little edgy," but Goldberg promised, "There are words you cannot say. I will not say them." 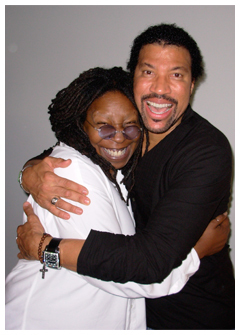 Set to join The View on the day after Labor Day, Goldberg continues to host Wake Up with Whoopi, a Manhattan-based morning radio show whose Web site has the slogan, "She does what she wants to do. She says what she wants to say." That's what led to the premature evacuation of O'Donnell, who regularly warred with the Bush administration and Donald Trump among others. But Goldberg said she sees The View as "a great opportunity to have some fun with folks and with you guys."